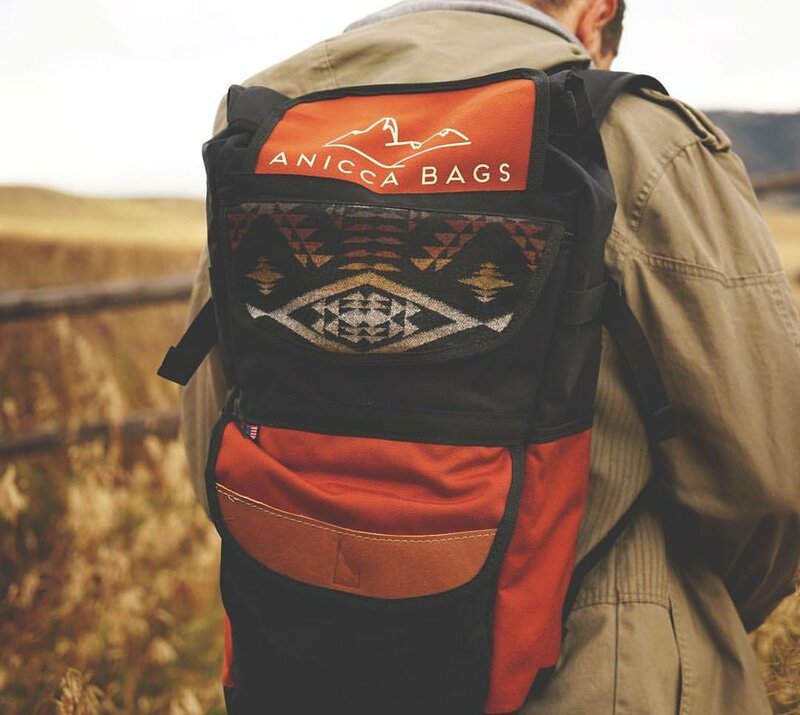 Anicca (Ah-knee-cha) Bags: 100% Handmade bags & accessories made in the teton valley. ESTABLISHED 2013 - FOUNDER Jeremy Holmstead - EMPLOYEES 3 - LOCATED IN Driggs, Idaho. Jeremy has called Idaho home for most of his life. A passion for cycling, backcountry skiing and being in the wilderness stole his heart at an early age. It was after a devastating skiing accident that Jeremy began sewing. He found himself with a lot of downtime during the healing process. As his mobility was limited, he decided to channel his adventurous spirit into creating with his hands. His grandparents had given him a sewing machine and he soon found himself making a backpack with materials he had on hand. He began experimenting with different fabrics and techniques while collaborating with friends on custom designs that fit their needs. The outcome was a plethora of durable colorful multi use packs, bags and purses. Anicca Bags was born. Anicca ( Ah-Knee-Cha) is a word he learned at a Vipassana Meditation retreat which means "always changing." It coincides with the way Jeremy wants his company and products to constantly grow and change. The authentic dialog between the different fabrics, colors and textures combined with utility and durability is what makes Anicca Bags unique. Each bag is marked by a personal touch placing emphasis on a high quality finish. "There are so many bag companies out there already. I don't just want to make you a bag; I want to create something for you that is unique and meaningful, as well as useful." Jeremy and his wife Marinna currently spend their winters skiing in the Tetons and the summers traveling around the Pacific Northwest in their 1972 Ford Econoline Camper van, Gus that they have customized to fit their venturesome lifestyle. They are both building out their skoolie "Atas" as a tiny home with a small mobile sewing office to travel in. Chris Miller was born and raised in Portland Oregon. Growing up around an eccentric culture played a major role in his creative development. From an early age he found crafting and making things with his hands an exhilarating experience. It was on a trip to Alaska several years ago that he was introduced to leather working and was instantly hooked. From there he began exploring all types of design and decided to start with the essential bi-fold wallet. We welcomed Chris to Anicca Bags with open arms, and are excited to see what comes next. When he isn’t creating custom leather wallets for Anicca, Chris likes to spend his time skiing the Tetons with his girlfriend Cody. He enjoys being out in nature, hiking, camping, fishing and biking. His attention to detail and creative mind plays a unique role with Anicca’s products.